Inder Loves Folk Art: Works in progress (and miscellaneous). I've been feeling a bit uninspired with my sewing lately. Joe refuses to wear hand-mades (except t-shirts), and Maggie refuses to wear anything. Work has been stressful, and my weekends have been booked with social engagements. I'm juggling work, kid-stuff, friends, garden, and sewing, and everything seems to be getting short-shrift. Despite all that, I do have a few little sewing things to share. 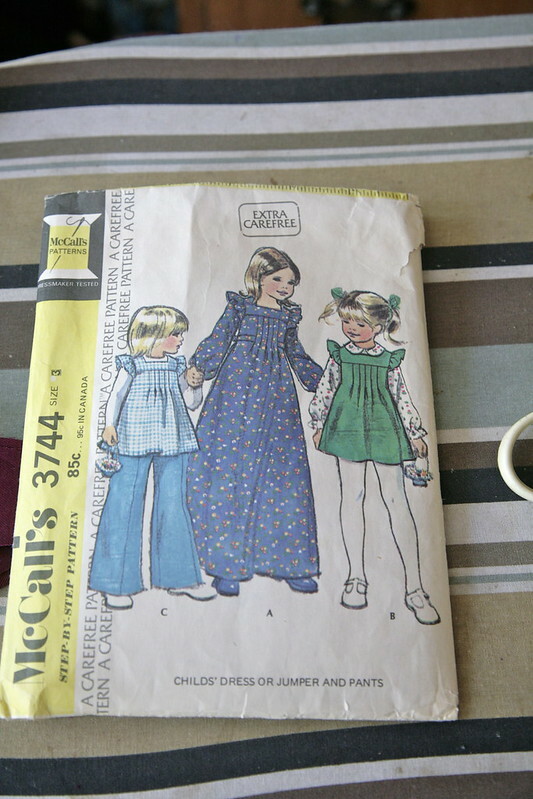 A gift for my friend's daughter, a little dress made from a really cute 1970s pattern that another friend gave me. I wish it came in more than one size! Little H is four now, but I am hoping that this size 3 (in the shorter dress version) with a lot of extra length will fit her, as I find that most older patterns have quite a bit of ease (but ooh, boy, were those dresses ever short!). 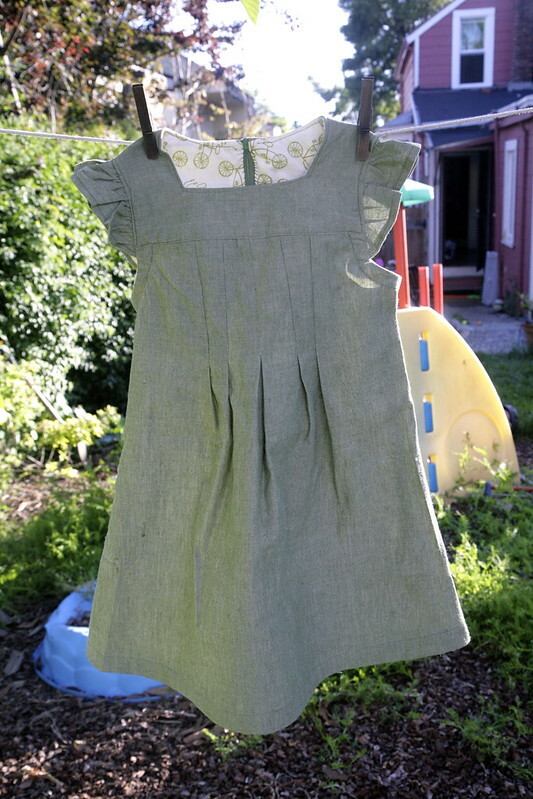 I used a lovely and breezy, but very wrinkly Andover chambray. You'll never believe this, but I pressed this right before photographing it! Oh well, it's a summer dress; a little rumpliness adds to its charm. I know that I just give Maggie's chambray items a good shake out of the dryer, and that's as much as I'm willing to do, so I expect this will often be a bit rumply. 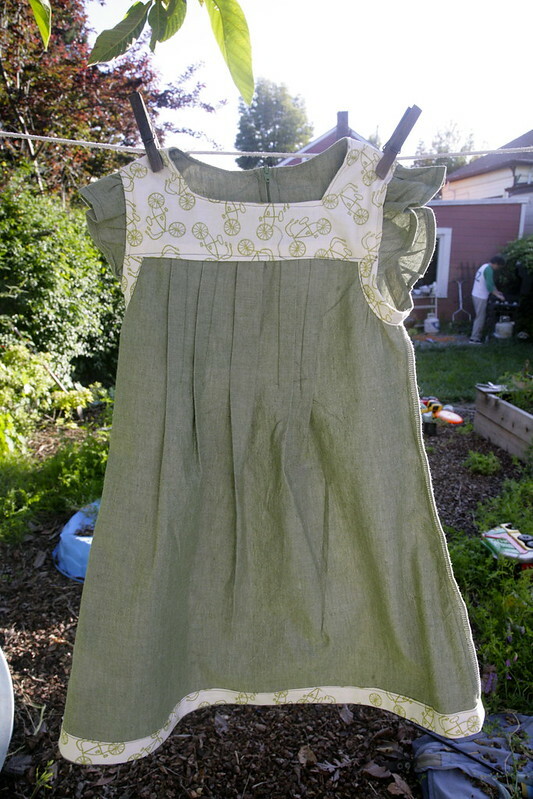 I lined the yoke and faced the hem and armholes with an adorable bicycle print, to add some fun to the dress. The pattern had armhole facings in addition to the yoke lining, but I made a little bias facing instead. I managed to get all of these facings out of a fat quarter of this fabric, and I was pretty pleased with myself! Here's a quick and easy upcycle that I did for Joe. 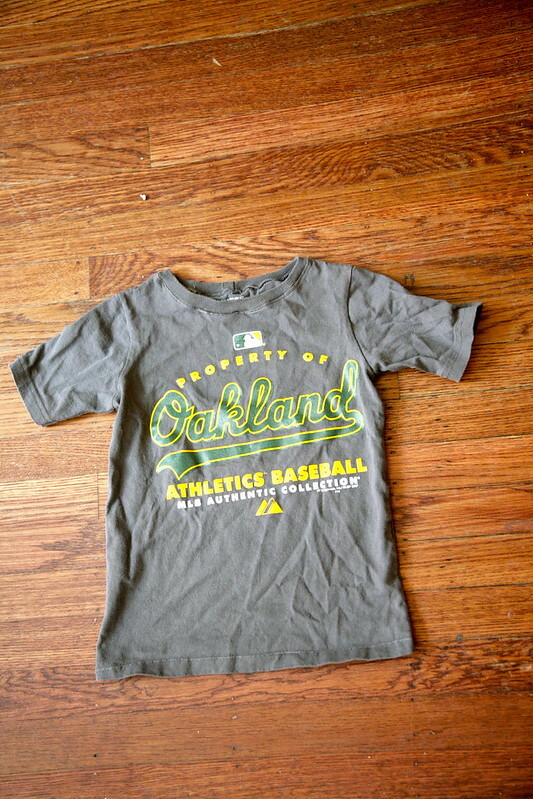 Steve is a season ticket holder for the Oakland A's, so he got this freebie XL t-shirt. I sized it down for Joe using my trusty Flashback Skinny Tee pattern, in the size 5, but with extra length to accommodate my long-torsoed Joe. Here you can see it after being worn and washed a half dozen times already. Joe loves to dress like his daddy, so you will often see him wearing some type of A's paraphernalia. Since he's a bit anti-mama-mades, this seemed like an easy project that I could do for him that I knew he would like. And some works in progress. 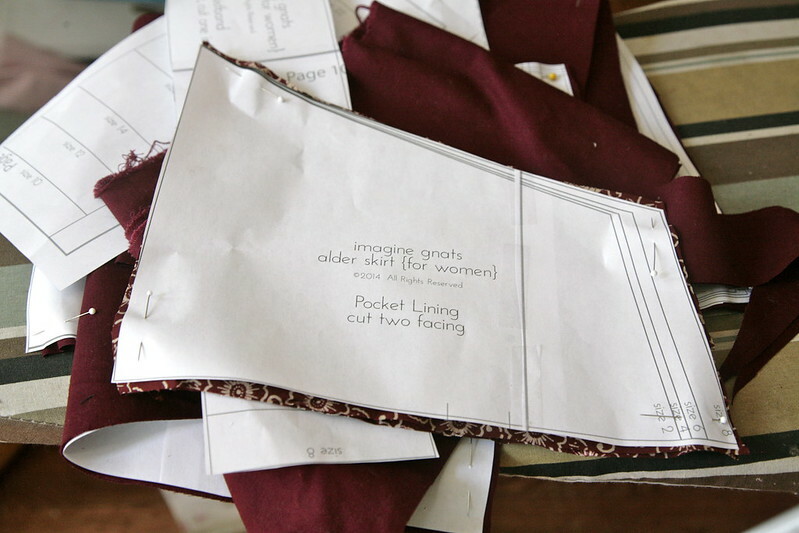 Pattern testing the Alder Skirt by Imagine Gnats. And running late, since she's about to release the pattern! I often bite off a bit more than I can chew, sewing-wise. But hopefully I'll have a finished skirt to show you very soon. With a pretty pocket lining, of course! Last but definitely not least, here's a sneak peek at the apron I'm working on. I've finished the smocking at the waist and now I'm working on embellishing it with some "chicken scratch" embroidery (a.k.a. depression lace, gingham lace, etc.). 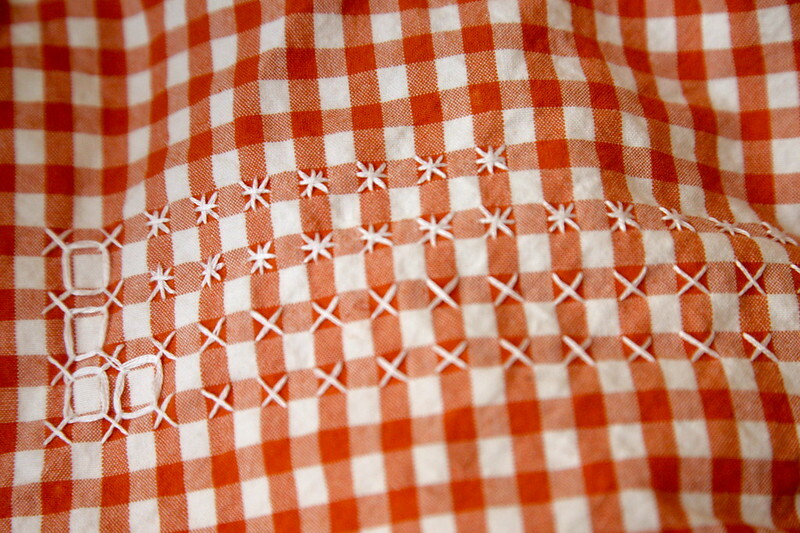 This is a type of embroidery traditionally done with white floss on gingham. It's really fun and surprisingly easy, but it's definitely not speedy! At least not compared with sewing - sometimes I forget the different pace of handwork. Of course, my ambitious plans to smock the waist and embroider the hem, pocket and bib, aren't making this any faster. Still, it's nice to have a project that you can work on in front of the TV, in the car, or take with you. Maybe I should start embroidering while I listen in on long conference calls at work - I'd be done with this in no time! That's today's update. More soon, I promise! Pretty embroidery, I look forward to seeing it finished. Don't lose heart, keep plodding away. Oh, Inder, why are our children so ungrateful when it comes to our sewing for them?! As for ironing - I don't do it either! Love the little vintage dress and the T-shirt! Why WERE those dresses so short? Was it just a thing to have underpants hanging out? I am so confused when I look at those patterns.